Excellent pamphlet outlining the origins and development of the Argentinian working class movement, focussing in particular on the anarcho-syndicalist FORA (Federación Obrera Regional Argentina). Anarchism is the philosophy of a new social order based on liberty, and unrestricted by man-made laws; the theory that all forms of government rest on violence and are therefore wrong and harmful, as well as unnecessary. Anarcho-syndicalism is anarchism applied to the labour movement. From small educational groups to federated leagues, libertarian organisation grows from the base upwards. In all areas of the world libertarian ideas, organisation and revolt have emerged, despite the repression of Fascism, State communism or military juntas. The word 'anarchos' means 'no rule', deriving from the Greek. The word 'anarchist' was used during the French Revolution as a scornful term for the libertarian elements who opposed the dictatorial rule of the Directory. In 1840 a French printer Pierre Joseph Proudhon published his classic analysis of capitalist's private property, 'What is Property?'. Here he argued that the State is an instrument of coercion used by the capitalist class to enforce its property relations on the workers. Abolish property and the State will have no function. Over the next 80 years Anarchism easily rivalled Socialism and Communism as the major form of progressive thought in Europe. A large area of support was the peasantry, but as the poor were forced into the cities by the economy, artisan workers and industrial workers began to discuss libertarian ideas and form anarchist organisations. When English trade unionists hosted the formation of the Interna­tional Workers Association, anarchists were present and their influence grew in the European sections and finally around the world. Anarchist theory and organisation developed with activists like Bakunin, Kropotkin, Malatesta, Reclus, Michel and many others, adding to the analysis of the State and popular resistance. In contrast to the Marxists, Liberals, Socialists, etc. Anarchists concluded that the State cannot be taken over for anyone's benefit because it has its own interests. The heralded 'dictatorship of the proletariat' would merely be a dictatorship over the proletariat; these insights are no less true today. Against the capitalists we say 'liberty without socialism is privilege and injustice', 'socialism without liberty is a barracks' we reply to the Marxists. Libertarian socialism, libertarian communism or anarchist communism, whatever you may call it, for the anarchists it is a free society without the State. Argentina is a vast country, sprawling over 2,700,000 square kilometres. At the time of anarchist immigrant arrivals it had a population of less than four million, of whom two thirds lived in towns of more than 2,000 population. The rural areas had been taken over by a small sect of lano::ners who had driven out the Indians. These landlords set up a feudal system that throughout Latin America is called 'latifundia', which resulted in bosses becoming aristocrats and the workers, rural poor peasants, becoming peons, i.e. serfs. Small businesses and factories emerged with the growth in the urban areas, poor accommodation and insufferable everyday life threw many against the State, but most just struggled to survive. With the poverty came the parasites, vermin, prostitution; and with some of the immigrants and their bosses, religion in the form of Catholicism. Outside the cities and towns work was available, but at starvation wages. Job sharks preyed upon the native poor and immi­grant labour, enticing their subjects with promises of land and money. Such employers sold food to their wage slaves, leaving them poorer still. With the sale of farms and factor­ies, labourers were included in the 'bargain' as there was a law which made the peon the slave of his boss. Many tried to escape, pursued by the posses of military whose sole job was to prevent the escape of any peons who chose flight rather than death from starvation. One young immi­grant named Auguste Vaillant returned to France after experiencing this torturous life. Where, again in poverty, outraged at the smug bourgeoisie he threw a bomb in the Chamber of Deputies. Though no one was killed he was sentenced to death and went to the guillotine proclaiming to the world 'I am an anarchist'. He was just one of the many who would pay with their lives because of their acceptance of the anarchist cause. Immigration increased after the Franco-Prussian War and the defeat of the Paris Commune. The boom for capital­ists, by introducing mass European immigration should have brought huge economic disaster for the local native workers, as cheap labour would take the jobs (a fear Fascists today still try and use to divide the workers). Instead, many of the immigrants came with the revolutionary ideas of their regions, because the governments of the Old World were expelling militants by their thousands. Blacklisting meant falling into the bottomless pit of poverty, ending in degradation and humiliation, so many took the chance to go to Argentina. From Poland, Ireland, Belgium, Italy, Spain, France and Russia the anarchists came. Marxists went to the United States, impressed with Marx's analysis of the Stars and Stripes scene. Fraud, violence and control by landed oligarchs was the rule. The capitalist class was almost wholly immigrant, though the bourgeoisie tended to be native. It was the comparative weakness of the ruling class that led them to maintain power through the Army, which has ever since maintained its political role. It was against this background that the infant anarchist labour movement began to organise and prepare the way for the creation of one of the greatest revolutionary unions of all time, the Federacion Obrera Regional Argentina. The origins of the anarchist movement in Argentina remain relatively unknown, but can be roughly traced to the found­ing of a section of the First International in 1872 in Buenos Aires. As far as we are aware there are at least two ver­sions of the events, one giving credit to an Uruguayan anarchist called A. Juanes. The other version asserts that a small group of French socialists, probably expelled after the Paris Commune, were responsible. Whatever the true version of the events it should be noted that the anarchist movement owed much to the work of immigrants. This continued to be the case for many years and later led the Argentinian government to believe that it could end all industrial unrest within its borders simply by deporting a few 'foreign agitators'. By 1873 the International Workers Association had firmly established itself in the capital. Three seperate sections, divided into French, Spanish and Italian speaking workers, flourished and gave the organisation a total membership of around three hundred. In 1874 a further section of the International was founded in Cordoba, while in March 1875 several affiliated members were arrested in connection with an arson attack on a church. All eventually being released due to lack of evidence. Two tendencies (the authoritarian socialism of Marx and the anarchism of Bakunin) had always existed within the International and after the split at the Hague Congress in 1872 the Marxists and Bakuninists went their separate ways, effectively destroying the organisation. In Argentina it was no different. The propaganda by anarchists dominated the thinking behind the struggle of the workers and often the struggle itself. Only the workers themselves, organised into their own fighting bodies, could improve the condition of the working class. Poverty is the cause of the disease and the only vaccine that can cure it is revolution. 'La Verdad' published by Doctor John Creaghe advanced few political opinions, instead it concentrated on reporting the struggle of workers and peasants and the bitter conditions which provoked these struggles. For anarcho-syndicalists there is little interests in political struggles, nor confidence in politicians. Progress is achieved by unions of workers (not social democratic unionism which requires an employing class from which to make demands), by self-management of economic and social struggles. This meant for John Creaghe that the workers unions with no bureaucracy, local autonomy and the syndicalist tactics of direct action would achieve the goal of stateless socialism/anarchism. In 1876 the Bakuninists set up their own 'Centre for Workers Propaganda' (the first anarchist centre in Argentina) and published their own paper 'La Voz Del Obrero', while the Marxists did the same, publishing 'La Vanguardia'. In 1879 'El Descamisado' began publication in Buenos Aires. It marked an important stage in the development of the anarchist movement in Argentina. Until then nearly all propaganda had to be imported from Europe. During the 1870's around 8,500 immigrants per year (main­ly from Italy and Spain) were arriving in the country. During the 1880's the figure shot up to 63,000 per year, then it 'stabilised' during the 1890's to around 32,000 per year. Instead of finding the streets 'lined with gold', they found the same misery and poverty they had left behind. Socialist and anarchist ideas had found their audience. By 1895 seventy-five percent of the working class were immigrants. Ettore Mattel was among the first wave of Europeans to arrive. Born in Livorno, Italy, in 1851 he was active as an anarchist in the International from 1868 onwards. Having been thrown out of Italy as a result of his political activities he tried, unsuccessfully to settle in France. Around 1884 he was forced to move on again and found himself in Argentina. In Buenos Aires he helped to start up the influencial 'Anarchist Communist Circle' and continued to play an important role within the movement for several years. Another early immigrant was Emile Piete; he arrived from Belgium in 1885 and with the help of Gerard Gerombon set up the 'International Bookshop' in Buenos Aires. In the same year the well-known (to both the workers and the police) anarchist Errico Malatesta arrived after a warrant for his arrest had been issued in Florence. He stayed in Argentina for four years, transforming the 'Anarchist Communist Circle' into the 'Circle for Social Studies', and on 22 August 1885 he helped to launch his own paper 'La Questione Social', giving it a similar content to the same paper he had founded in Italy in 1883. The paper was moderately successful (fourteen issues were published altogether) and it lasted about a year. Several other anarchist papers were published around the same time. 'El Perseguido', founded in 1890 advocated collective action. 'La Protesta Humana' appeared in Buenos Aires in 1897 (in 1903 the word 'Humana' was dropped; as 'La Protesta', a daily newspaper, it was very successful), Pedro Gori and John Creaghe helped to transform it into a brilliant forum of local and international news and comment. In 1894 'El Oprimido', edited by John Creaghe was published in Lujan and Buenos Aires. It was a monthly and took an anarcho-syndicalist stance. It engaged in fre­quent polemics with those who felt that participation in unions was 'reformist' and with the left-wing dissidents within the Socialist Party who were sympathetic to syndical­ism. In 1897 'El Oprimido' closed, but 'Ciencia Social', the major anarcho-syndicalist review at this time had become well established with many contributors from around the world. The anarchist movement in Argentina was steadily taking shape, by the late 1890's it was a major force within the workers movement. The time had come to expand their actions. The first workers association in Argentina was the Typo-graphical Society founded in Buenos Aires in 1857 by the workers under the influence of the ideas of Saint-Simon. From this society, which had contacts with anarchists in Spain and elsewhere, came the first workers journal 'El Artesano' edited by Bartolome Victory y Suarez. In 1877 the Typographical Society changed its name to the Typo-graphical Union - the first trade union in Argentina - and in 1878 it organised the first strike, involving some 1,000 workers. Although the strike was a success (a modest wage rise was gained), the appeal of trade unions was slow to take root at first and it was not until 1885 that the second union (a carpenters union) was formed. In 1886 Mattei convinced a group of bakers, many of them already committed anarchists, to form their own union. They elected him general secretary of the union in August 1887. Malatesta helped draw up the union's aims and principles and later was involved in the unions first strike, over pay and conditions, in January 1888. Lasting ten days the strike succeeded in forcing employers in grant­ing a thirty percent wage rise. The decision to take strike action was taken after police violently broke up a union meeting. The aims and principles written by Malatesta for the bakers union were later 'borrowed' by several other unions, giving them all a revolutionary character. In 1888 'cordonniers', railworkers on the Buenos Aires-Rosario line and metal workers all followed the bakers union and went on strike. In the following year the number of strikes over pay and conditions shot up to fifteen. As early as April 1888, Malatesta was arguing for the formation of a workers federation in order to give unions more clout. Not all anarchists were enthusiastic. Faced with a new method of struggle (revolution through industrial action) the movement split into two camps. On one side were the anarcho-collectivists who unconditionally supported the idea of revolutionary unions, not only as a way to bring an anarchist society nearer but also as a way to win workers over to their cause. On the other side were the anarcho-individualists who were not Stirnerites but admirers of Ravachol and the Spanish 'desheredados' group. They denounced strikes as reformist and distrusted unions because they had too many rules and regulations. They preferred 'to work tirelessly towards the revolution' through networks of affinity groups and 'propaganda by the deed'. The anarcho-individualists (and here we must add that this was not a title they used themselves) published a variety of irregular, inflammatory journals; the most successful was undoubtly 'El Perseguido' founded in 1890. Its constant call for dynamite against the opppressive capitalist regime soon made it the most popular anarchist paper of its day During its six year lifespan over me hundred issues were published and from an initial circulation of a thousand in 1890 it steadily increased in popularity. According to one source 7,000 copies alone were sold on Mayday 1891. Even more enthusiastic in its call for arms was the French language paper 'La Liberte'. Founded in 1893 in Buenos Aires one of its occasional contributors was August Vaillant, who we already mentioned as an early victim of repressive local capitalism. Much has been made since of the so-called 'terrorist' outrages perpetrated by anarchists around this time. What is rarely mentioned is the mass terrorism employed by governments daily to suppress strikes, protests and insurrections. The total number of kings, queens, presidents and generals assassinated by anarchists over the years still only amount to a tiny fraction of the dead compared to the massacred millions who died at the hands of governments and their army and police agents. Yet it is still the anarch­ists who are mentioned as the 'terrorists'. The first socialist groups began to appear in Argentina at exactly the same time as anarchist ideas were taking root amongst workers and from the very beginning until the 1930's and beyond it was the anarchists and socialists who dominated the workers movement, not the marxists. While the anarchists set up the Centre for Workers Propa­ganda and the Anarchist Communist Circle, the socialists set up the Vorwarts Club, Eganux Club and Fascio dei Lavatori Centre. But while the anarchists debated the pros and cons of anarcho-syndicalism, socialists went ahead and founded the first workers federation in Argentina in 1890. They also organised the first Mayday demonstration in the same year. The first socialist federation was short lived, and in 1894 and 1896 they tried again to form lasting workers federations, but because of their anti-anarchist line none of their federations lasted longer than two years. In 1896 a Socialist Workers Party was founded by Juan B. Justo along European lines 'to fight in the interests of the workers'. Its aims included the abolition of the death penalty, universal suffrage, an eight hour day and better working conditions for all. Anarchists denounced the party as reformist and the gap between anarchists and socialists began to grow wider. Socialists denounced the anarchists as unruly and claimed their ideas were fit only for the '1umpen-proletariat'. By 1894 many anarcho-collectivists were seriously contempla­ting the idea of a workers federation themselves. Several papers to back up their view sprang up. In the same year the Bakers union began to put out 'El Obrero Panadero' under the editorship of Mattei. Fortunato Serantoni started 'La Questione Social' (reviving Malatesta's old title). The following year saw the publication of a fourth anarcho­collectivist paper 'L'Awenire'. It was founded by a group of Brazilian exiles. All these papers called for the formation of a workers federation along anarchist lines. Several unions under anarchist influence signed a 'Solidarity Pact' in the hope that it would lead to the creation of a federation. It met with the same lack of success as the earlier socialist federations. By 1893 a total of twelve unions existed in Buenos Aires, while in 1894 the figure had risen to twenty-one. The number of strikes reached an all-time high of nineteen in 1895, all over the appalling wages and conditions the workers were expected to put up with. In a snowball effect, a victorious strike would provoke strikes in other industries and convince other workers outside the unions to affiliate. Conversely, an unsuccessful strike would seriously reduce union membership. In 1896 there were twenty-seven unions operating in the capital alone. Anarchists were the most influencial in the textile workers, and plasterers unions. While the socialists dominated the butchers, cigar makers, shoe makers, cabinet makers and bakers unions. Often both tendencies existed side by side. The stone masons union for example was founded by the anarchists in 1890 but taken over by the socialists a few years later. The position was reversed again in 1895, when the executive council expelled a member for distributing anarchist litera­ture among his fellow workers only to see the decision reversed at the general assembly of the union. In April and June 1896 a dozen anarchist dominated unions organised two conferences and for the first time floated the idea of a general strike. Within a few months the idea was put into practice, when a railworkers strike broke out on the Buenos Aires - Rosario line. The strike quickly spread to the Buenos Aires - Tolosa line and then extended to Campana, Junin and Rosario. In Rosario anarch­ists organised a general strike of all trades and the idea inspired workers in La Plata and Buenos Aires to do the same. By September 6th 1896 some 25,000 workers were involved in sympathy strikes. Anarchists did all they could to extend solidarity and although the strike eventually collapsed it had a huge effect on the workers movement. The revolutionary potential of strikes had shown itself for the first time in Argentina. The lesson was not lost on the ruling class either and in December 1898 the Army was called when strikes threatened in other industries. Strike breakers and blacklists came into operation on a large scale for the first time. As a result of its anti-union line and in view of the drama-tic increase in strike action, 'El Persequido' lost all its previous influence and ceased publication abruptly in 1896. In 1897 'El Oprimido' stopped publication in order to make way for the founding of a new anarchist newspaper which was at first called 'La Protesta Humana', but has been known as 'La Protesta' ever since 1903, the name it still carries to this day. It began life as a weekly on 13th June, by 1904 it had become a daily and has since been widely recognised as one of the most successful anarchist papers of all time. Those involved in the founding included G. Inglan Lafarga (a carpenter from the Spanish region of Catalonia), Francisco Berri (a baker), John Creaghe, E. Arana (both doctors) and Jose Prat (a Spanish journalist). Among its first overseas correspondents were Ricardo Mella and Anselmo Lorenzo (the father of Spanish anarcho-syndica­lism), who both contributed regular articles from Spain. Its original circulation was 2,000 but this soon rose to 4,000 as its popularity grew. From its first issue it argued for the setting up of 'a-political' workers federations (i.e. free from political parties) and in 1900 it ran a series of twelve articles by Antonio Pellicer Paraire which in no small way contributed to the founding of the Federation Obrera Argentina (Workers Federation of Argentina) in 1901. The period 1900-1902 saw another intense increase in the number of strikes and the growth of the workers movement. On January 5th 1900, for example, 5,000 stevedores went on strike in the port of Buenos Aires demanding an eight hour day, better pay and conditions. The strike paralysed the port for two weeks and soon spread to other ports. In Bahia Blanca dockers won a nine-hour day after taking effective strike action. The time had come to organise and co-ordinate the struggle. At the end of 1900 several unions (cabinet makers, marble workers, carriage makers, house painters, stone cutters, belt makers, engineers and graphic artists) came together and agreed to publish their own paper which they called 'La Organizacion'. As mentioned earlier the idea of unions coming together into a federation was not new, but previous attempts all ended in failure, but now the climate was changing. Soon after the founding of 'La Organizacion' the engineers sent out an invitation to several other unions asking them to attend a conference with the view to setting up a federation. The conference was held in Buenos Aires on 2nd February 1901 but due to low attendance at the conference a further one was planned. It took place on 2nd March 1901 and brought fourteen unions together. This conference made a call for a congress to be held, and sent out messages to more unions to attend. On 25th May 1901 at a congress attended by twenty-seven unions the Federacion Obrera Argentina was founded, later to be called the FORA. The organisers stressed the workers organisation as the natural weapon for the struggle against the State, for strikes direct action, 'revolutionary gymnastics' (a term used to explain 24-hour general strikes, lightning strikes, disruptive marches, etc.). They openly held anarchist beliefs and alle­giances. By the time of the second FOA congress in 1902, a socialist minority would break away. 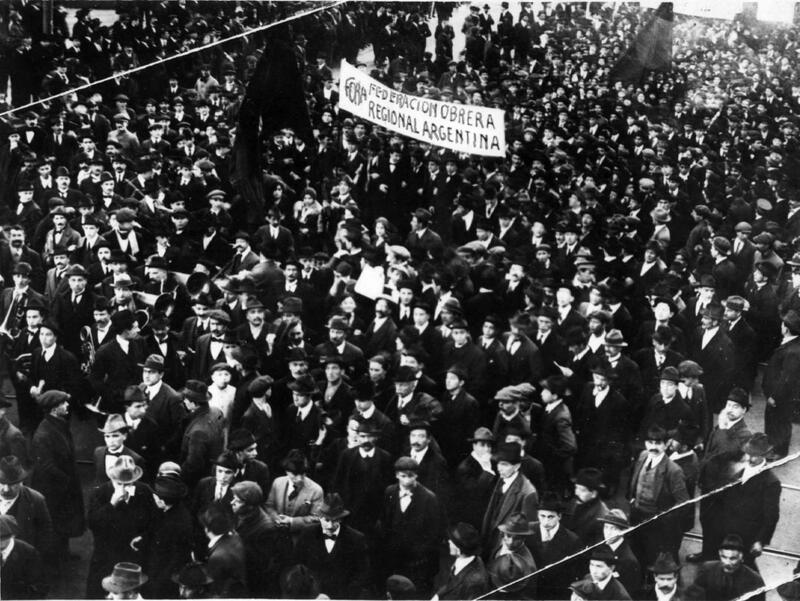 In October 1901, barely five years after the FOA had been founded, a strike involving 1,000 workers broke out at the sugar refinery in Rosario. The strike, like almost all strikes taking place at the time was over wages and a demand for an eight-hour day. On the 20th October a small delegation of workers, all anarchists, were elected by the workforce to negotiate with the management, but before negotiations could start, police arrested one of the delegation, a man called R. Ovidi and attempted to drag him away to the police station. In the ensuing struggle police opened fire on the workers, killing 30 year old Cosme Budeslavich. At first the police claimed that Budeslavich, an immigrant of Polish-Austrian descent, was a 'dangerous anarchist'. Only later did it transpire that the man belonged to no organisation. Four days after the murder 6,000 workers demonstrated against police violence in Rosario, while a 24-hour general strike, organised by the FOA was observed in several cities. From January 1902 onwards the FOA organised a nation-wide boycott campaign against 'La Princesa' bakeries after the company had refused to allow the union to operate in their bakeries. The boycott proved to be so successful that the police arrested two FOA comrades in the hope that this would break the boycott. In response to the arrests a general strike of all bakery workers was called and on 26th July, Buenos Aires was to find itself almost without bread. The strike involved some 7,000 workers and a workers co-op operated to provide bread for the workers and their families. On 30th July the strike turned to selective actions; strikes broke out at bakeries where the bosses had failed to give in to the workers demands. Scabs were given permis­sion to carry guns 'for their own protection'. On the 19th August thirty police raided the FOA offices on the pretext that they were investigating the mysterious deaths of several scabs. Many FOA militants were arrested and tortured; the strike collapsed on the 24th August due to lack of funds. The second congress of the FOA in mid April 1902 saw eighty-six delegates representing forty-seven unions attending. The divisions in the union between socialists and anarchists soon came to a head. Nineteen unions under the influence of socialists walked out. These dissident unions formed their own socialist federation; the Union General de Trajabadores (General Workers Union). Having rid themselves of the disruptive elements, the FOA delegates (still the majority) went on to discuss a variety of topics and made recommendations to abolish all night work and hold employers responsible for all accidents at work. In May 1902 the FOA organised their own Mayday demonstrarions, attracting 15,000 workers. The socialist rally was attended by about 5,000. With the bakers' strike barely over, the stevedores in Buenos Aires walked out in a dispute over the excessive weight of the cereal sacks they had to carry. The strike resulted in two days of pitch battles between the strikers and the police. After the socialist split, the FOA gained about 15,000 new members when the Cart and Coach Drivers Union joined them. The year 1902 was just about to see the start of another major strike; this time by the fruit handlers, which would have involved the entire membership of the FOA, but the government quickly moved the Anti-Alien Act through Congress, in fact in four hours. This gave the police the power to deport 'undesirable' aliens and to prevent entry into the country of aliens deemed 'undesir­able'. This was the government's reaction to the huge wave of strikes that was sweeping the country. After the passing of the Act, mass arrests took place, union offices were raided and closed, and anarchist printing presses were broken up by the patriotic mobs. Anyone under a deportation order was held in incommunicado until they left. 'La Protesta' was forced to suspend publication for awhile; its editor Lafarga went into hiding. In December under the new State of Siege, all FOA and UGT offices were closed down. The sheer scale of repression temporarily paralysed the workers movement and most anarchist journals went underground. Other journals including 'Ciencia Social', 'El Rebelde', 'L'Avvenire', 'Nuova Civilta' and 'Solidaridad' disappeared altogether after their editors were either jailed or deported. Only one anarchist paper continued to publish after the State of Siege. 'El Sol' was edited by A. Ghiraldo who was born in Argentina and therefore could not be deported. The State of Siege was lifted in January 1903, but arrests still continued on a mass scale. In early 1903, John Creaghe helped financially relaunch 'La Protesta', also becoming its editor. During the period April 15th to July 15th, the 42 associated unions of the FOA received 15,212 new subscriptions. By the same time the following year the figure had risen to 32,893 and the number of unions affiliated stood at sixty-six. The fight to repeal the Anti-Alien Act was the theme of the 1903 Mayday demonstrations, which in turn called forth more repression. After the passing of the Act the police looked upon all strikers as criminals (rather like Britain today). FOA held its Third Congress on 6th June 1903 in Buenos Aires. Eighty delegates attended and thirty proposals were put forward and discussed over a period of three days. Top of the agenda, naturally enough, was the State of Siege and its effects. Socialists were roundly criticised at the Congress for failing tc support FOA's general strike against the Law in November. On the 16th December 1903, 5,000 sailors walked out in Buenos Aires in the biggest strike the port had ever seen. After four days on strike employers approached the government and asked permission to bring in 1,200 scabs. The FOA answered by threatening to call out all the dockers in the port. The government ignored the threat and the first of the strike breakers were brought in under police protection on December 24th. Violent clashes followed, at which point FOA's stevedores walked out in every port. The strike even spread to Montevideo across the river Plate in Uruguay. On January 4th 1904, a full scale riot erupted on the waterfront in Buenos Aires as scabs tried to unload one of the ships. When police attempted to intervene and protect the scabs a gun battle took place between armed strikers and police. One anarchist named Zapoletti was killed and a policeman was seriously wounded. One of the daily papers claimed Zapoletti's last words were 'Viva la Anarquia'. The 1904 Mayday demonstration organised by the FOA attracted over 50,000. The march began at Congress Square and ended in Mazzini Square, where the speakers were due to address the rally. The march set out in good spirits but by the time it arrived the mood had changed. The mounted police charged the crowd and shots were exchanged. One demonstrator and one policeman were killed, over one hundred were wounded. "We must not forget that a union is merely an economic by-product of the capitalist system, born from the needs of this epoch. To preserve it after the revolution would imply preserving the capitalist system that gave rise to it. We, as anarchists accept the unions as weapons in the struggle and we try to ensure that they should approximate as closely to our revolutionary ideals. We recommend the widest possible study of the economic philosophical principles of anarchist communism. This education, going on from concentrating on achieving the eight-hour day will emancipate us from mental slavery and consequently lead to the hoped-for social revolution." Meanwhile in Rosario on 20th November 1904 the shop assistants came out on strike for an eight-hour day and better working conditions. When the windows of shops belonging to employers involved in the dispute were broken by persons unknown, a bill was sent for the damage to the local office of the FORA by the city police chief. Of course the FORA refused to pay the bill, four local activists were arrested; the strike turned into a general strike thanks to the police. During the clashes that followed a young baker was murdered by the police. The FORA made arrangements for his funeral and extended the general strike for another two days. Fearing more confrontation with the strikers the police stole the body of the young comrade from the mortuary and secretly buried him. When the FORA found out what had happened around 300 com­rades gathered at the local offices and marched forward to find the body. They were soon attacked by the police and armed vigilantes shot dead two workers and a ten year old boy. Over one hundred others were wounded. When the news reached Buenos Aires of the attempted massacre a general strike was called by both the FORA and UGT. The government fearing a popular uprising called out 5,000 troops and the navy warships in the harbour turned their guns towards the city. The cities of Cordoba, Mendoza and the district of Santa Fe were all paralysed by the strike. The State backed off and allowed matters to cool off for awhile. Throughout the year 1904 there were 188 strikes. New methods were now being employed to break the power of the FORA. In January 1905 a catholic priest (not for the first time, and as we have seen in recent years in Spain not for the last time) formed a scab union of dockworkers. Its title was 'Sociedad Argentina', its job was simply to make sure that whenever there was a strike its members would en-sure the docks went on working. This of course with the help of the police and military. After the failed military coup of February 1905, another 'State of Siege' was de­clared and more militants of the FORA were rounded up and deported, including the FORA's general secretary, Francisco Jaquet. Arrest, imprisonment, torture and deporta­tion became the order of the day. The time had come to strike back. On 11th August a twenty-four year old anarchist, Salvador Planas, tried to kill the President while he was on his way to Parliament. Unfortunately, the gun jammed twice, giving the President's bodyguards time to overpower Planas. Planas was sent to prison for 13 years, but he managed to escape after 5. The day after the assass­ination attempt the UGT held its Third Congress and to the surprise of many called for closer ties with the FORA. But at the FORA's Fifth Congress the idea was rejected; a standing ovation was given to Salvador Planas (in his absence, naturally); a motion recommending FORA members not to be taken prisoner without justification was passed; as was the decision to adopt anarcho-communism as the FORA's official ideology, which was passed unanimously. FORA was now an anarchist union federation. The years 1906 and 1907 were turbulent years for the ruling class. In 1906 some 137,000 workers were involved in strikes and by the time FORA held its Sixth Congress in September 1906, 105 unions were affiliated. On 25th January 1907 a joint 48 hour general strike was held by the UGT and FORA in solidarity with the workers in Rosario who were engaged in on going strike actions. Almost 150,000 observed the strike call; 80,000 in Buenos Aires alone. In Bahia Blanca, when the dockers went on strike, their union headquarters were attacked by Marines who killed one comrade. At his funeral another comrade was shot dead by the police. In that year there were 231 strikes. 1907 also saw the start of a big rent strike in the capital. With the constant arrival of immigrants the accommodation in the capital was fast disappearing. There was a real shortage of housing, which left tenants at the mercy of landlords. The anarchists were prominent in the struggle for a reduction in rents, encouraging tenants in one area to refuse paying rent until it was lowered. From a small beginning, the strike spread throughout the capital; soon nearly all the working class areas were involved. It even spread beyond Buenos Aires to other cities and became a nationwide strike. Like all hard struggles it had its victims. Miguel Pope was shot dead during an eviction and several FORA militants were deported because of their involvement in the strike. "....in view of the Law of Residence, which discriminates against anarchists born abroad, I as a native born anarchist unaffected by the Law, protest against the deportations of my comrades...."
In 1909 a certain Colonel Falcon became prominent as Chief of Police and persecuted the anarchist and workers movement with gusto. At the anarchist organised Mayday demonstration in Buenos Aires in the presence of Colonel Falcon the police attacked the rally and killed eight people, leaving another forty wounded (many critically). So great was the outcry against the Colonel that the Socialist Party, who had always opposed the anarchists and had not partici­pated in their demonstration, made common cause with them and called for a general strike. The strike was declared and lasted nine days. It involved 250,000 workers, lead to the arrest and imprisonment of 2,000 militants and the closing down of many workers centres. A further three workers were to be murdered by the police in the following days. On 8th May the government gave in and ordered the release of all those arrested and the reopening of the closed workers centres. In September, a second attempt to form an united federation of the FORA and UGT took place. Only a few FORA unions took part in the Congress, as the matter was already discussed in detail at the Seventh Congress of the FORA and soundly rejected. As a result of this 'Congress of Unification' a new federation was formed; the 'Confederacion Obrera Regional Argentina'. The CORA th .1 took the place of the UGT which disappeared. On 13th October some 20,000 workers struck in protest against the State murder of the libertarian educationalist Francisco Ferrer in Spain. A general strike from the 14th until the 17th October was organised and observed in many cities. "...I killed Colonel Falcon because he ordered the massacre of workers (Mayday 1909)...1 am a son of working people and a brother of those who have died fighting the bourgeoisie..."
Unprecedented repression set in. 'La Protesta' was raided, its printing presses were destroyed; workers centres underwent the same fate. Within 48 hours thousands were arrested, many were sent to Tierra del Fuego (the Siberia of Argentina); others, the foreigners, were deported after torture. Martial law was declared and lasted until January 1910. Armed vigilantes burned down the offices of several unions, the FORA's general secretary Juan Bianchi was deported. The State of Siege was eventually lifted on January 13th 1910. 'La Protesta' reappeared after its editor­ial group had been freed from their painful imprisonment aboard the warship 'Guardia Nacional'. In March a new daily evening paper 'La Batalla' began publication. It was edited by Rodolfo G. Pacheco and Teodoro Antilla. The FORA's Eight Congress was held in April. In May on the anniversary of the 1810 independence from Spain the anarchists threatened to call a general strike for 25th May, near centenary day. On 8th May they demanded that the government repeal the Anti-Alien Act, free working class political prisoners and grant an amnesty to those avoiding military conscription. On May 13th the government began to arrest anarchists, notably the editors of 'La Protesta' and 'La Batalla'; members of the federal council of the FORA and many more (including the central committee of the CORA). Armed thugs, members of patriotic fronts attacked union offices and halls. But despite the repression and more than 2,000 arrests the strike went ahead as planned. The clampdown that followed was so severe that the FORA was forced to operate underground for the next three years. A bomb exploded in the Teatro Colon; no lives were lost as the opera house was empty at the time. The anarch­ists insisted that the act was done by police agents in order to give the government the excuse to pass more restrictive legislation. A Russian anarchist was framed and sentenced for the deed, although he was never proved to be the perpetrator. The government passed the 'Law of Social Defence' which was mostly directed against anarchists. Anyone associated with an anarchist group could be refused entry into the country, ship's companies were held responsible for passengers and made to repatriate anyone refused entry. Permission was required to hold meetings, either indoors or outdoors, the display of the red flag was forbidden. Anyone found placing a bomb was subject to 10 years in prison, if the bomb damaged property to 15 years and if it resulted in a death to the death penalty. Anyone who incited others by threats or intimidation to strike or boycott was also facing jail. All those convicted under this law lost all civil rights. A naturalised citizen had their citizenship revoked. 'La Protesta' continued publishing illegally and managed to distribute between 7,000 and 10,000 copies each week. The grip was broken in 1913, 'La Protesta' became a daily again on the 20th July. A wave of strikes hit the country. In November 'La Protesta' published an article about Simon Radowitzky (because of his youth he was sentenced to life in prison, where he was assaulted and sodomised by the assistant Governor). The article was written by Teodoro Antilli. The police raided the offices of the newspaper and seized copies of the 'offensive' issue. Antilla was sent to prison for three years, Apolinario Barrera, 'La Protesta' editor, got eighteen months. At the Second Congress of the CORA on 26th September 1914 a decision was taken to join FORA 'en masse'. The fact that most CORA affiliates were antagonistic to anarchist ideas and practices soon created problems. At the FORA's Nineth Congress on 1st April 1915, the federa­tion's commitment to anarchism was overthrown and the FORA reverted to the a-political stance FOA had held a decade earlier. Immediately the Nineth Congress was over anarchists within the Federation organised a special Congress on 2nd May and re-adopted their anarchist aims. Twenty-one unions affiliated immediately and there were now two FORA's. In February 1916 a further split developed, this time within the ranks of 'La Protesta', after a row broke out when Barrera was accused of having received money from one brewery to stir up trouble amongst workers at another. As a result Gonzalez Pacheco, Antilli, F. Gonzalez and Allieui left 'La Protesta' and began to publish 'La Protesta Humana' as a rival to the daily. Nineteen seventeen was another violent year; at one socialist demonstration alone that year twenty-six workers were shot dead by the police. FORA demonstrations were also under attack; on 10th June several workers were murdered by police at a FORA rally. A further dozen or more workers were to die during strike actions. The Russian Revolution revitalised the workers movement worldwide. The anarchists were very impressed with the events in Russia, though they were not taken in by such new terms as the 'Dictatorship of the Proletariat' as certain other sections of the workers movement appeared to be. The anarchists with their foresight did not have to wait long before the 'Dictatorship of the Proletariat' became the 'Dictatorship over the Proletariat'. On 19th July 1918 the anarchist FORA went out on general strike in solidarity with the railworkers of the South and Pacific Companies. The non-anarchist FORA (sometimes called the syndicalist FORA) disowned the strike. In November 1918 Barrera was again arrested, this time for helping Simon Radowitzky to escape briefly from Ushuaia penitentiary. He was captured in Chile and along with Barrera returned to prison. On 7th January 1919 workers at Vasena Iron Works (an English company) came out on strike for an eight hour day (they had to work eleven hours). Scabs, protected by police, were brought in to break the strike, while strikers and their families came out onto the streets to throw stones. In one incident police opened fire and killed four, wounding a further twenty or so. An indefinite general strike was called by the anarchist FORA; the non-anarchist FORA called a 24 hour strike. On 8th January 200,000 workers attended the funeral of the victims, but police again opened fire on the crowd, this time killing fifty and wounding hundreds more. Anti-labour reactionary groups organised terror squads and attacked union buildings. Workers were arrested, a pogrom against Jewish people was staged. The workers struck back as best as they could and attacked and disarmed police on the streets; the Vasena factories were burnt down; armories were raided; gun battles broke out and in certain areas armed workers militias patrolled the streets. For several days Buenos Aires was transformed into a battle ground. On 9th January, unknown to its members, the leadership of the non-anarchist FORA signed a secret agreement with the government to end the strike. The next day the 'La Protesta' offices were attacked by the police who were backed up by the newly formed 'Patriot League of Argentina'. President Yrigoyen appointed General Luis J. Dellepiane as Military Commander of the capital, who then promptly posted 30,000 troops around the city. On 11th January the news of the secret deal between the government and the non-anarchist FORA became known; the membership of the federation ignored the deal and stayed out on strike. It was the beginning of the end for the non-anarchist FORA. Meanwhile the strike had spread to Mar el Plata, San Fernando, San Pedro, Avellaneda, Rosario, Santa Fe, Bahia Blanca and Tucuman. Only on the 12th and 13th did the strike slowly start to subside. And for the first time the true scale of the horror that was to enter history as 'La Semana Tragica' became known. Over seven hundred workers were dead, 2,000 more were wounded, 55,000 were arrested and all that within the space of one week. 'La Protesta' was raided again and closed down, as was 'La Obra' (edited by Pacheco and Antilli), 'El Burro' (edited by Oreste Ristori, circulation 40,000) and 'Bandera Roja' (circulation 20,000). Many were deported and finally on 4th May all anarchist papers were banned. But while the non-anarchist FORA faded away the anarchist FORA grew. At a special Congress held in October 1920 some 400 unions were affiliated. The non-anarchist FORA held their Congress in January of 1921 in La Plata. That year was particularly bitter and bloody strike wise; there were long and violent disputes in La Forestal, Buenos Aires port and among the shepherds of Patagonia who stayed out for almost a year. On Mayday at the demonstration in Gualeguaychu several workers were shot dead by the gunmen of the Patriotic League. On 26th May other members of the League attacked the FORA taxi drivers head office in Buenos Aires; killing two more workers. All the members of the FORA's executive council were arrested yet once again. In Patagonia a wave of strikes broke out simultaniously. During the year long struggle in the region, which was now in a total state of rebellion, over 1,100 workers were massacred by the army under the command of General Varela who was headquartered in Santa Cruz. The rebellion in Patagonia has long ago entered into the history of the international workers movement as one of the great heroic struggles but because it neither followed Marxist lines or involved Marxists it has been totally ignored by the so-called socialist historians. In March 1922 the non-anarchist FORA organised yet once again a Congress of 'unification' along with several other independent unions. By the end of the Congress a new body had been formed called the 'Union Sindical Argentina'. The syndicalist FORA was now officialy disbanded. General Varela's days were now numbered since the events in Patagonia and on 25th January he was assassinated in Buenos Aires by the anarchist militant Kurt Wilckens (a comrade of German descent). Some five months later on 16th June, Wilckens was murdered while asleep in the hospital wing of the National Penetentiary. Prison guards smuggled one Jorge Perez Milian, a Patriotic League member, into the prison to carry out the killing. Milian later avoided being charged with the deed by claiming insanity, but the plan backfired when Millan was himself murdered by a genuine lunatic called Lucich in a mental hospital. Some unkind people have suggested that an anarchist put him up to the deed. In Berlin in 1922 the International Workers Association was founded, this was a direct reaction to the founding of the Bolshevik Red Trade Union International in Moscow the previous year. The FORA sent a delegation to Berlin and later affiliated to the IWA (better known by its Spanish initials AIT). The FORA held their Nineth Congress (the 1915 Congress was never recognised by the anarchists) on 31st March. It reaffirmed FORA's anarchist position and slated the idea of the 'Dictatorship of the Proletariat' once again. In 1921 the anarchists in Argentina along with the interna­tional workers movement launched a campaign for the release of Sacco and Vanzetti, two Italian comrades facing execution on a trumped up charge in the United States. (The struggle was unfortunately lost in 1927 when they were callously put to death for a crime they never committed). Parallel to the Sacco and Vanzetti campaign, the FORA fought for the release of Simon Radowitzky, who was rotting away in prison for the assassination of the butcher Colonel Falcon. The 'Free Simon Radowitzky' campaign succeeded in forcing the government to release Radowitzky in April 1930. It signalled the last major victory by the Argentinian anarchists over the government. During the 1920's the anarchist movement suffered a number of internal splits, roughly polarised around the two influential anarchist papers 'La Protesta' and 'La Antorcha' (it should be pointed out here that neither of these papers were the mouthpieces of the FORA, which published its own paper called 'Organizacion Obrera'). In September 1924 FORA itself got caught up in the dispute after advising its members to boycott 'La Antorcha' and several other pro-'Antorcha' journals. Around the same time another split developed in the movement, this time it centered around Severino Di Giovanni, an Italian immigrant and individualist-anarchist, who was a follower of the 'propaganda by the deed' school of thought. Di Giovanni had arrived in Argentina in 1923 and was soon involved in both the 'Sacco and Vanzetti' and 'Free Radowitzky' campaigns. He specialised in bombings of capitalist institutions in and around the capital; his main period of activity was between 1926 and 1928. It did not take long for him and the comrades who worked with him to become the most wanted people in Argentina, he was declared Public Enemy Number One. The respect Di Giovanni commanded amongst some sections of the anarchist movement was only matched by the hatred he provoked amongst others. 'La Protesta' took an openly anti-Di Giovanni line, which hardened as the bombings got more indiscriminate, 'La Antorcha' took a more ambiguous line. Neither paper particularly pleased Di Giovanni, and both were denounced at one time or the other from the columns of his own paper, 'Culmine'. The war of words soon escalated and on 25th October 1929 someone assassinated Emilio Lopez Arango, one of the editors of 'La Protesta'. At first a group of bakers who were members of the same union as Arango were suspected of the killing but although it has never been proven conclu­sively Di Giovanni and his group are the prime suspects. He carried on his guerrilla war with the State until early 1931, when he was arrested and executed by firing squad along with other comrades on 1st February 1931. Faced with the rising tide of unemployment the FORA initiated a six-hour day campaign, later adopted by the International Workers Association in March 1925. Incredibly over sixty years later, there are still many workers who have not even achieved an eight hour day. The Tenth Congress of the FORA was held from 11th to 16th August 1928. Some one hundred unions were re-presented at the Congress which turned out to be the last major Congress of the federation before the military coup of General Uriburu took control and plunged the country into total darkness for almost the next fifty years. The anarchist movement was almost totally destroyed, only today is it beginning to recover from its ordeal. The lunatic theory put forward by the Tupamaros amongst others, that a people repressed will become more hardened and therefore more ready to rise up and throw off the oppressors has time and time again been disproven, especially in Latin America. In 1929 just before the coup, a series of strikes once again hit the country; the dockers held a twenty-four hour strike in protest against the Patriotic League. Within the first few months of 1929 the bakers struck in Buenos Aires, followed by the building workers in Bahia Blanca and the brickmakers in Lomas de Zamora. A wave of strikes also hit Avellaneda. On 14th May the building workers in Buenos Aires struck and one comrade, Caputto was killed. In July stevedores walked out in Rosario and within a week the strike became a general strike. Four hundred arrests were made around the same time during a ten month strike against General Motors. On 20th May FORA staged a twenty four hour strike in solidarity with the 'Free Radowitzky' campaign. On 6th September 1930 troops led by General Uriburu staged a successful coup d'etat and overthrew the constitutional government. As in previous years the anarchists and the FORA were forced underground, but this time the scale of repression virtually broke the workers movement. Many militants were to be killed by death squads while others were to face the state firing squads. Penina, a distributor of 'La Protesta', was executed by firing squad in Rosario, his crime was distribution of 'subversive' literature. 'La Protesta' had to be suspended as the Post Office acting on government orders, refused to sent it through the mail. The FORA brought out an underground paper called 'Rebellion'. Anyone caught distributing any of the anarchist papers could sentenced to Chauffer', but ment. Martial Antorcha' together with the daily 'La Protesta', the journals 'Rebellion' and 'Ideas', and the FORA brought out a joint manifesto called 'Eighteen Months of Military Terror', informing the people f the true state of the nation. In the same month as the military coup yet another reformist workers federation was formed to combat the influence of the FORA. While anarchists were hounded underground the new Confederacion General de Trabajadores (CGT) - an amalgam between the Union Sindical Argentina and the socialist Confederacion Obrera Argentina - began to establish itself freely throughout the country. As soon as martial law was lifted, anarchists who had survived the 24 month long dictatorship of Uriburu came together in September 1932 to hold a specifically anarchist Congress in Rosario. More then fifty delegates and many more observers attended the four-day event, ending in the creation of a Comite Regional de Relaciones Anarquista (CRRA) and the founding of a new anarchist paper 'Accion Libertaria'. In October 1935 the CRRA became the Federacion Anarcho-Compnista Argentina (FACA), giving Argentina a specifically anarchist federation to complement the anarcho-syndicalist FORA. The year 1936 saw the start of the Spanish Revolution and the organisation of international aid through the 'Solidaridad Internacional Anti-Fascista'. The SIA was one of the first international anti-fascist organisation. It is a sister group of the IWA and has for many years provided valuable assistance to the victims of Fascism. Many militants from Argentina fought alongside the CNT­AIT (including Simon Radowitzky), only to return defeated in 1939 accompanied by Spanish anti-fascists on the run from the Franco-ist terror that followed. State repression in Argentina continued throughout the thirties as one military dictatorship succeeded another. On 4 June 1943 General Pedro Ramirez seized power on behalf of the army and another round of repression, arrests, deportations and torture ensued. At this crucial moment the FORA split for a second time in its history. Having failed to act upon agreements made in 1941 the FORA's 'Consejo Federal' (Federal Council) was censured and expelled at a delegates meeting representing over twenty unions in July 1943. In retaliation the expelled Federal Council refused to disband itself and over the next twenty years continued to claim it represented the 'real' FORA. Although it remained relatively inactive and tiny in comparison with the larger FORA the split undoubtedly caused confusion and demoralisation amongst the already diminished organisation. Meanwhile Colonel Juan Domingo Peron, a supporter not only of the Ramirez coup but also of the Uriburu coup thirteen years previous, was building himself a power base within the dictatorship as head of the new Ministry of Labour. As State Arbitrator Peron often settled industrial disputes in favour of the unions in exchange for their support. He went one step further by replacing union leaders with his own supporters. Outside of his role as Minister of Labour, Peron built up his own private army, modelled on Hitler's 'Brown Shirts', to terrorise opponents. When a rival faction of the army became uneasy over Peron's manoeuvres and obvious ambitions they tried to imprison him in 1945. But it was too late; Peron had managed to gather together enough support among the population to force the army to set him free. Inevitably, Peron took over the country in 1946, aided and abetted by his equally corrupt and power hungry wife Eva Duarte ('Evita') - a failed 'actress' with delusions of grandeur. Argentina declared war on the Axis powers in March 1945 and was the last Latin American republic to do so, thus it was boycotted by the United States. When Peron came to power the US continued to distrust the regime and Peron used this tension to portray himself as standing up to the US in defence of Argentina's independence. During this time real wages rose by 37% due to industry-wide contracts and increased the standard of living for the working class. The CGT Constitution declared itself to support Peron and his policies. All other unions that were independent were illegal and their strikes likewise. Constitu­tional changes included immediate re-election of the President at the end of term, the ability to declare a State of Siege 'in the event of a disturbance of public order threatening to disrupt the normal course of life or the essential activities of the population' and long speeches by Peron became part of the system itself. The FORA continued to organise as best as it could, attracting 3,000 to its traditional Mayday demonstration in 1946. Despite Peron's ban on all strikes FORA bakers in the Moran, San Martin and San Miguel district of Buenos Aires went on strike in protest over appalling working conditions from 26th May onwards. Police responded by closing down the union head office. Peron had obviously vowed to destroy any union he could not control, just as Marx had vowed to destroy those sections of the First International who defied him seventy-five years earlier. Newspapers critical of the regime were either closed down or taken over by the Peronistas; the conservative 'La Prensa', a Buenos Aires daily was handed over to the CGT after a bogus 'labour dispute' was used to censor the critics, who in all other ways had little sympathy with those who advocated social changes! All educational institutions, particularly universities, were put under the control of rectors who were appointed by Peron himself; religious instruction (Roman Catholicism is the official religion in Argentina) was made compulsary in all national schools. Priests were invited by the Peronista party and trade union meetings to give their blessing to the proceedings. The Church fell out with the leader when 'Peronismo' was taught as the 'one true faith of all Argentines' and the State tried to give illegitimate children the same rights as those enjoyed by children out of wedlock. Divorce was legalised in 1954 and Peron decreed that brothels be re-established. Religious holidays and festivals were removed from the calendar, catholic newspapers closed, priests imprisoned, religious teachers dismissed and two bishops expelled from the country. In August 1946 FORA dockers initiated a boycott campaign against Spanish-owned ships in solidarity with Spain's persecuted working class, while on 28th October FORA organised an impressive 24-hour general strike in Buenos Aires in solidarity with striking taxidrivers and shipbuilders. In some areas of the capital (La Boca and Barracas) 70% of workers were reported to have observed the strike. The FORA, written off by academic historians from as early as 1920, was clearly far from dead. In December 1947 FORA won a further victory over the Peronist government by obtaining the release of five contruction workers from San Martin who had been sentenced to life imprisonment during a strike that took place during the Uriburu regime. At the same time however, FORA inspired strikes by dockers and bakers were declared illegal and smashed, public meetings were banned and nearly all of FORA's offices were shut down. In 1948, 172 FORA dockers had their workpermits confiscated, thus depriving them of their livelihood. Only after a 24-hour strike were the workpermits returned. Next .on the government's hit-list were the bakers. After a twenty - day long general strike, causing severe bread shortages in the capital, police arrested several union officials and closed down FORA premises in Moran. One militant was detained for a week and tortured. The CGT immediately disowned the strike, leaving FORA standing alone against the State's reaction. In San Miguel the bakers were more successful. After a nine-day strike a wage increase was negotiated in December 1948. In 1949 more public meetings were banned, including the FORA Mayday demonstration in Buenos Aires. (But they managed to hold it in Rosario instead). FORA dockers further infuriated Peron by refusing to mourn the death of Eva Duarte in 1952. Also in 1952 saw the publication of 'Agitacion', a newspaper which published information from commissions set up in Buenos Aires and other inland towns, and brought together all sections of the libertarian movement. In 1955 a combination of military, Church and business interests in opposition overthrew Peron despite 'his CGT' resisting. The CGT was dissolved by the new regime and the unofficial or black CGT (CGT Negra) was led by the textile workers leader Andres Framani. This CGT organised opposition to the government and during 1956-7, five million working days were lost through strikes. In 1957 the CGT split into the '62' unions loyal to Peron, the '32' anti-Peron unions and the '19' of communist affiliation. Although obviously reduced in strength after ten years of neo-fascism the FORA attempted to rebuild itself against all odds. It retained considerable influence among dockers, taxidrivers, bakers, buildingworkers and plumbers although not all these unions were affiliated at this stage. 'La Protesta' even re-appeared briefly before police seized its editor and jailed him for 12 months. A FORA Mayday demonstration was held in 1955 in Buenos Aires. The following year the Ministry of Labour introduced a law obliging all trade unionists to pay their dues to the CGT. The FORA stepped up its 'Free Trade Unions' campaign, resulting in more victimisation. The autonomous shipbuilders federation bravely continued to fight for a six-hour day, while all attempts by the FORA's taxidrivers union to hold a general assembly were consistently banned; 'La Protesta' re-appeared once again. On 11 October 1956 more repressive measures were used to intimidate workers who stil refused to observe the new State laws. Ramiro Garcia Fernandez, a CNT veteran from the Spanish Civil War, was assassinated by strike breakers during a lock-out dispute involving 8,000 dockers in Rosario. It was a clear warning to all those who carried on the resistance. The repression worsened during 1957 and 1958. FORA's problems were further compounded by a second and third split in 1958. For a brief period there were four organi­sations in existence all claiming to be the true FORA and three newspapers, each claiming to be the real 'Organi­sacion Obrera'. These splits were not ideologically based, but rather the result of tactical and personality clashes within the movement. They tend(ed) to be short-lived unlike the Marxists who have built whole parties around disagree­ment and personalities long forgotten by the vast majority of the workers movement. Student riots in 1959 against the regime led to an informal alliance between the new generation of student militants and the older generation of 'Foristas'. A meeting organised by the Federation Libertaria de Argentina to commemorate the Spanish Revolution was banned by the police. In the same year Carlos Kristof, affiliated to the FORA's plumbers union, was arrested along with others during an industrial dispute and accused of 'terrorism'. It was the first of a wave of arrests of militants spanning 18 months. Next to fall victim to the police were 6 taxi-drivers, arrested outside FORA premises in Buenos Aires, followed by two-hundred plumbers involved in a lock-out dispute (eighty affiliated to the FORA). FORA's Comite Pro-presos y Deportados suddenly found itself busy once more and campaigned for the release of all militants with the aid of the general anarchist movement. By January 1961 all had been released, then in October 1961 some twenty militants connected to FORA's plumbers union were arrested but no charges were brought. In 1962 Frondiz, the pro-Peron President was overthrown by a coup. Earlier in 1961 contact between Che Guevara and Borlenghi (the number two man in Peron's govern­ment and his Minister of the Interior for eight years) was established. The fall of the Peron government in 1955 was a heavy blow to Guevara and the communists who saw Peron as 'progressive' and later invited the dictator to settle in Havana. (He chose Franco's Spain). In 1963 the CGT held its first conference since the fall of Peron. In the year 1964, 3,000,000 workers were involved in the occupation of over 11,000 factories. They demanded the release of trade union and political prisoners, abolition of repressive legislation, the legalisation of banned unions, full employment, worker participation in management of companies, strict price controls of basic necessities, agrarian reform, a return to the constitution, freedom for the Peronist Party to organise and protection for national industry. In 1966, under the leadership of the metalworkers leader Augusto Vandor, the CGT supported the military coup against President Illia in return for CGT participation in the gover­ment. General Ongania however banned strikes, froze wages and placed unions under government control. This regime, the so-called 'Argentine Revolution' of three Commanders in Chief. banned all political parties and subordinated the constitution to the 'Statute of the Argentine Revolution'. The FORA was represented by several centres in Buenos Aires and groups of militants inland. It had no unions but 'Forist' groups within the different unions. The committee for prisoners and deportees continued its crucial work, and leaflets, manifestos and the newspaper 'Organizacion Obrera' were published. The FLA continued meeting and publishing 'Accion Libertaria' and through the publishing house 'Reconstruir' pamphlets and classic anarchist works were able to appear. 'La Protesta', with an editorial collec­tive elected by militants, published sporadically and semi-clandestinely with no editor or printers name. It defended the revolutionary movement, in particular the student and workers insurrection activity such as the May-June popular risings in Cordoba and Rosario. The Paris General Strike of May 1968 generated enthu­siasm around the world and in Argentina small groups of militants formed, courses were run on anarchism in the premises of the Shipbuilding Workers Federation. Leaflets were distributed and contacts sought. The 1968 CGT election saw Peronists lose and a CGT of the Argentinas (CGTA) was formed from a split under the leadership of Raimundo Ongaro which was persecuted by the government with the collaboration of the CGT leader Vandor. In May 1969 the liberal facade of social peace acquired by the military government was shaken when following the murder of a student by police demonstrations began in the North. The murder of two more students by the Rosario police led to street fighting and barricades. After several hours the army occupied the city and declared Martial Law. In Cordoba, a strike by key factory workers was quickly followed by a march into the city centre which was broken up by police shooting into the crowds. Troops occupied the city, set up Councils of War, curfews were imposed, etc. Agitation continued in other cities. The bourgeois press blamed HAVANA and as always an interna­tional 'foreign' conspiracy, stressing damages to private property more than lost workers lives. Following the example of Law no. 4144, in operation for more than half a century, a new law was passed for the expulsion of foreigners. Direct action had fallen out of use but was being redis­covered by the generation of new workers. The eight-hour day won with much effort had ceased to be respected by employers and many now worked ten or twelve-hour days. The FORA argued for a six-hour day still. Ongania fell from power and General Lanusse (1971-73) permitted limited political activity and eventually elections. The old swindle of politicians began in earnest. The Peronist candidate Hector Campora once elected allowed Peron to return from exile in Spain in 1973. Peron in power again had a loyalist CGT whose collaborationist bureaucrats organised attacks upon the workers who engaged in strike action against the wage freeze imposed from above. In opposition were 'co-ordinadora' or alternative leaders of the CGT and the number of strikes increased. Peron's Minister of Social Warfare, Jose Lopez Rega, organised the infamous Triple A (Argentinian Anti-communist Alliance) death squad which assassinated union and political militants. Armed resistance emerged which was met with General Videla's bloody security forces. Industrial action continued against repression, demanding wage rises. In 1974 Peron died, succeeded by his wife Isabella with support of the CGT leaders. Castro, the 'communist', proclaimed three days of mourning and Cuban officials termed Peron's death a 'blow to all Latin America'. In March 1975, opposition leaders were elected to the CGT's offices in the steel producing area of Villa Consti­tucion. These 'oppositionists' were all arrested by the security forces. In July 1975, wildcat/unofficial stoppages culminated in a general strike for 48 hours by CGT members and the government dismissed Lopez Rega, but retained the AAA. In March 1976, a military Junta headed by General Videla seized power and unleashed massive and systematic repression on a similar pattern to the military dictatorships in Chile and Uruguay three years earlier. Union militants were arrested and 'disappeared', trade union activity banned and all unions had military officers take control of them. Free play of 'market forces', cuts in public spending, fall in real wages, elimination of opposition was met by strikes in the motor industry and power workers in 1976; rail, oil, bank and maritime workers in 1977; dockers and railworkers in 1978. Repression and high inflation (175% in 1978) provoked a general strike in April 1979 which saw 30% of the work-force strike. The National Commission of Labour (CNT), made up of unions with military officers in control and the Commission de los 25 (a successor to the old CGT including the group of 25 unions not taken over by the military) joined together as the CUTA (Conduccion Unica de Argentinas) and did not support the April strike. The CUTA was accepted. by the regime for a short while until its two parts, the 'CNT' and the '25' split over their re-presentation on the International Labour Organisation and the International Congress of Free Unions. Most union activity was of course organised locally and in secrecy outside of these large organisations. General Videla fell to General Galtierre who in 1982 invaded the Falkland/Malvinas islands provoking the tragic war with Britain there. The British military won the islands after many deaths. With military defeat, a strike wave erupting in protest at falling living standards helped fell the Junta and Raul Alfonsin was elected as President after sixty years of military rule in December 1983. Congress was able to chatter on, newspapers babbled, artists posed, but rising inflation (550%) and the 'foreign debt' of $4,5 billion attacked the workers most. Some generals were retired, others were transferred, con­scription and military spending reduced, but the military bill is still high and includes Exocet missiles and Skyhawks jets. Captain Alfredo Astiz (known as the 'blond angel'), who was captured by the British troops during the island war but soon released, went on trial on 7th December 1984 for the murder of a Swedish woman in 1977. Other butchers though escaped 'justice'. 'Democratisation' of the unions, particularly the Peronist­led ones was rejected by the Senate where the Peronist majority voted it down. Only the workers can really change unions from vertical, hierarchical, gangster set-ups to hori­zontal libertarian organisations, not some government decree that 'legalises' free unions. The Falkland/Malvinas discussions broke down and the 'patriotism' for both regions distracts attention from unem­ployment in Britain and inflation in Argentina. Only the workers who produce the wealth in these two regions can reverse this misery. The example in Britain before the First World War of syndicalist sympathy strikes and in Argentina of the FORA show that the system does not remain unchallenged for long once organisation for social revolution is echoed in the working class's desire for emancipation. The FORA remains alive, even after the repression of numerous regimes, prominent in working class circles that have not abandoned the revolutionary camp. They proved the methods and principles of anarcho-syndicalism can survive as it did in Spain and that a movement can be large without compromise and without yielding to the various attempts at permeation or liquidation by the political opponents and false friends of anarchism. Workers can hit back against repression, and not suffer silently the destruc­tion of their organisation, nor police and fascists attacks on working class areas during industrial disputes. At the April 1984, 17th Congress of the International Workers Association held in Madrid, Spain, the FORA delegate spoke of the past struggles, present situation and future possibilities. New younger militants are organising and the FORA comrades have spoken at dockworkers meetings. They continue to resist their and our old enemies; the State and Capitalism. Never at any time and still less during these so uncertain and menacing moments as the present, could anyone laugh at the moral prestige of the movement of the Regional Workers' Federation of the Argentine (FORA). For, today, when a coalition is made between all the reactionary forces of capitalism; and the State united the eternal turn-coats of syndicalism for the purpose of destroying the FORA, it is absolutely necessary to defend our organisation and our militants. This is not a mere demonstration of protest and solidarity, it is the urgent duty of all those liberty loving people. Judges, police, and political leaders have exposed abso­lutely the democratic legalist lies in their sinister campaigns of repression against the militants of the FORA. shown the path of emancipation to their brothers and sisters in misery and unhappiness. The function of the politician is to lie in order to gain power. The function of the government is to lie to conserve power and defend the privileges of the ruling class. The people, vegetating in the sordid morass of the 'ranchos', from north to south, live the most degrading and the greatest of material misery in ignorance. And for pointing out these simple truths, those who protest are treated as 'agitators', that is to say, they are regarded as 'profes­sional agitators'. Trumped-up charges are laid against them or else they are placed in the power of Mussolini. What a destiny for a country that is no more but a common English colony and which entrusts the development and the guarantee of its rights to the politicians and the State. The Regional Workers' Federation of the Argentine whose flag is not that of political revolt, which does not seek power nor pursue class hatred, which, at the present moment is a minority force because the enemies of liberty and justice desire that it be so, will finish by being firmly rooted in the people and then will rise the dawn of security and prosperity. But today the struggle, sustained and dispersed, must be our aim and duty. Our struggle must be against reaction and the State and, above all, a struggle against the terrible pessimism that is overwhelming the proletariat. We appeal to the people of free conscience to associate themselves with our cause of justice and humanity. Bring an end, once and for all, to the deportations taking place. Only action can prevent injustice. Let all those who come here to work stay. Open the ports and frontiers to all those of the world who wish to stay here. Let the era of persecution, now and for all time, end. Bring an end to the persecution of the working people for their ideas of liberty! Simon Radowitzky was born in Kiev, Russia. He grew up in Argentina among the bitter labour disputes of the early twentieth century. Simon assassinated the Chief of Police, Colonel Falcon and his secretary Alberto Lartigau as they were returning from the funeral of the Director of State Prisons. The bomb thrown killed Falcon almost immediately, Lartigau died later in hospital on 14th November, 1909. Simon Radowitzky was just 18 at the time so he was too young to be shot/executed. He was jailed for life instead and sent to prison first in Buenos Aires, then in Ushuaia, Tierra del Fuego, the southernmost part of Argentina. The action was taken to avenge eight workers murdered in cold blood by police during a Mayday demonstration through Buenos Aires in 1909. Colonel Falcon who was present supervising the police gave the order to shoot down dead and wound many others at the front of the march. Children were amongst those injured by the State that bloody day. Falcon became infamous as a tyrant and while many complained at this injustice, Simon Radowitzky took action for his own and class's satisfaction. Is tyrannicide a crime? Many workers were openly sympathetic and called for his release as a class war prisoner. The warders of Ushuaia prison had standing orders to swing a lantern in his face every half hour as he tried to sleep. This and many more acts of brutality were daily life for Simon. In 1918 the Deputy-Governor, Gregorio Palacios, buggered him, then three guards held him down and raped him in turn. When Radowitzky's friends in Buenos Aires heard about the incident they published their version of the story under the title 'La Sodoma Fuegina'. Graffiti like 'Freedom for Simon Radowitzky' also appeared all over Buenos Aires. In October 1918, two anarchists hired Pascualino Rispoli to organise a jail-break. His ship, a cutter, anchored off Ushuaia on November 4th. Three days later Radowitzky in the uniform of a prison guard accomplice, walked through the prison gates. A dinghy ferried him aboard before the alarm went up. He escaped to Uruguay but was eventually caught in Chile from where he was returned to Ushuaia again. He spent the next twelve years in prison. Then in 1930 President Yrigoyen released him as a 'gesture' to the working class. In 1933 he was arrested again and exiled to Flores Island. In 1936 he went to fight in the Spanish Revolution with the anarcho-syndicalists of the CNT-AIT. During the Civil War he was wounded several times. In 1939 he was among the refugees who crossed the Pyranees into France by foot to escape from Franco's fascist army and his reactionary Italian and German allies. He then moved to Mexico where he spent the rest of his life. He died in 1956 of a heart attack aged 65, on March 6th. There is almost next to nothing written in English about the anarchist movement in Argentina. Most of the back-ground information in this pamphlet came through personal contacts and through the pages of the various libertarian papers published in Argentina over the years, especially 'La Protesta' and 'Organization Obrera'. Other works referred to are: Argentina by George Pendle; Hechos y Commentarios by E. Gilimon; El Anarcismo y el Movimiento Obrero en Argentina by I. Oved; Anarchism and Anarcho­syndicalism in South America by S. Fanny Simon; Contribu­tion a la Bibliografia Anarquista de la America Latina by Max Nettlau; Anarchism and Violence: Severino Di Giovanni by Osvaldo Bayer; Anarchism in Argentina and Uruguay by Eduardo Colombo; La FORA by D.A.de Santillan, 'Faccia a Faccia col Nemico' by Cesare delle Pieta. Politics and the Labor Movement in Latin America by Victor Alba. Additional sources were the Rapport sur l'Activite de 1'AIT, and the papers of the Syndicalist Workers Federation, 'Direct Action' and 'World Labour News'. The authors and publishers wish to thank the following organisations and individuals for their assistance in making this work possible. Federation Obrera Regional Argentina; Grupo Impulso (Rosario); Kate Sharpley Library, London; Centre International de Recherches sur 'Anarchisme, Geneva; Jose Luis (Agrupacion de Conductores y Motoristas Navales 25 de Noviembre); Christophe (French Anarchist Federation); Burnley DAM-IWA. Edited by C. Longmore, Lay-out by I. Frencken, typeset by ASP. All pictures and graphics Kate Sharpley Library. Funny this appeared as a bookmark today; was just reading on the wiki about the insurrectionist Di Giovanni and de Santillán who condemned him in FORA's newspaper constantly during his bombing campaign. I don't know it but thanks, might give that a look.